Parents are often left with just one hand and the challange of multi-tasking. The soho citybag, one hand diaper bag, springs open at the push of a button, allowing parents easy access to everything to care for baby. Very stylish. I love that I can put so much on this small bag. Beautiful creation. This is nothing but a must have for all moms. So light and yet can such a huge amount of baby things. This is the perfect baby bag. Not only it can carry so much things for my kid but it can carry my things as well. Never left this SohoBag since I have this. This is just so handy and Light to carry. Great bag! Love all pockets and everything has a place! Plenty of zipper pockets and I love that the outer zipper pocket has a hook inside to hold your keys! (So you don’t have to turn the bag upside-down to find them, one handed). Being a mom of 4, I have been through my share of diaper bags, consoles, organizers, take-alongs, you name it. I was very lucky to have found the Soho CityBag before baby number 4, and had wished it was available long before! The versatility and function of the bag is far above anything else I have ever carried, and helps keep me organized on the go. I can easily hang it on my CityHooks while taking out the stroller, or swing it over my shoulder while walking about. And no more worrying about if I forgot an extra onesie or a bottle, because everything has its place! I have been a Choopie fan since receiving my first pair of CityGrips last year from a fellow mom. So purchasing their Soho Bag was a no-brainer when I was on the search for a versatile and trendy bag for baby #2. It has an easy-to-access pocket, holder or pouch for everything from bottles, diapers, wipes, a change of clothes, cell phone, keys, laptop. Everything a mom on the go could ask for, and more. I have been searching for an all-in-one diaper bag for months prior to our son arriving and found the Soho CityBag to be perfect! It has pockets for all of my must-haves with the new baby and my toddler- including the bottle holders, zippered pockets, cell-phone pocket and key ring! Overall, the perfect solution for a mom who needs a place for everything. My favorite all-in-one bag so far. I have used the Soho bag many times before for short outings with my little one, though recently tried it out as my carry-on bag for a three hour flight to visit family. I was able to fit 8 diapers, a package of baby wipes, 2 spare baby outfits, a jacket, two empty bottles, a few small toys, snacks for baby and I, my laptop. cell phone and keys- and comfortably most importantly! It made the travel so much less having the extra room without getting in the way. And it hangs perfectly on the back of my stroller. I love this bag! Stylish and function all in one. On our recent family vacation- I couldn’t imagine venturing out without it. The included changing pad and wipes container made it so easy to comfortably change the baby at any given moment without having to look for a restroom with a changing table! And the insulated pockets were so helpful in carrying around her bottle, snacks and juice cup. Thank you Choopie for again creating such an innovative product! I have been using my Soho CityBag for almost three months now and just wanted to say how amazing and durable it is! The material is so easy to clean off or un-zip the inside to wash should you happen to have a spill, and I have found myself using it even without the kids in tow. 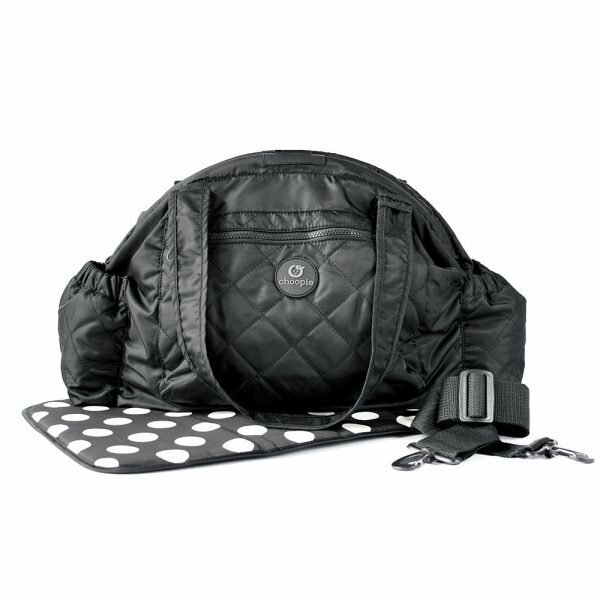 With the classy black exterior and cream interior, it is easy for it to be functional as a diaper bag and purse for me! The functional pockets allow me to carry absolutely everything when on the go from work, to daycare, to the park, and home. Perfect size, and perfect design! This bag allows me to take along everything I need without being bulky. I love the contrasting interior liner and durability- very well made. I love my Soho bag. With it’s classic black design, both my husband and I can carry it! The strap is very comfortable and it’s waterproof material is perfect for taking it anywhere and everywhere. No stressing about spilled milk in my purse anymore. I received the Soho CityBag at my baby shower and couldn’t have asked for a better gift! It is the perfect balance of fashion and function for a new (or seasoned) mom. The bag is roomy and has plenty of space to tote around all of my baby’s and my necessities, though also very easy to carry around and isn’t “bulky” like the other diaper bags I have looked into.